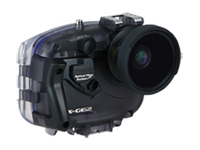 Here at AB Sea Photo, we have an extensive selection of Sea & Sea housings, strobes, arms and accessories. We carry both NEW and USED photographic equipment. 5 m / 16 ft *Based on General Imaging Company testing standards. 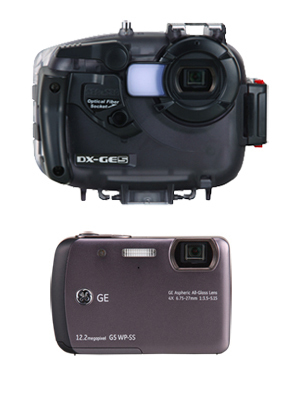 Promotional movie showing features of the DX-2G and sample images taken with strobe and other options. *Click "HQ" when the movie starts to switch to high quality image. Angle of view of 24mm at the wide-angle end. 1cm macro mode for close-up photography. Features a macro mode for close-up photography, allowing you to get as close as 1cm / 0.4inch to the subject at the wide-angle end or 4cm / 1.6inch at telephoto end. Even with a standard lens, you can achieve an angle of view of 24mm at the wide-angle end. Features SEA&SEA mode, a still image mode for optimal underwater photography. The color balance is automatically set so anyone can easily take pictures of beautiful deep blues. Capture the underwater world as vividly in your pictures as in your memories. Based on the DX-1G, SEA&SEA has applied its state-of-the-art technology to develop the housing design, paying special attention to even finer and more detailed controls. Now you can effortlessly operate all the capture- related buttons on the 2G camera’s body. 1/1.7-inch CCD with approximately 12.1 effective megapixels. High image quality with low noise and rich smooth gradation range that lets you capture perfect underwater images from highlights to shadows. Large, high definition 2.7-inch LCD monitor with 460,000 pixels. Vivid and bright display that lets you see even the finest details in the picture. The monitor features a wide angle of view (160° in any direction) and high contrast, and offers excellent visibility underwater. 24-72mm, 3.0x optical zoom lens that demonstrates excellent optical qualities for any lighting situation and focal length. Capable of RAW image photography. A newly-developed image engine and enlarged buffer memory allow you to take up to 5 continuous shots in RAW mode. The recording speed has improved to 3 seconds. Up to three individual settings of the My Setting function allow you to customize recording settings to your preference. This is convenient to assign frequently used functions to these customized settings. Convenient built-in electronic level. This allows you to easily verify that the camera is level using the level indicator displayed on the LCD monitor. [Still image] 180, 120, 60, 30, 15, 8, 4, 2, 1.1/2000 sec. [Movie] 1/30.1/2000 sec. 640x480 (15 frames/sec. ): 24 min. 2 sec., 640x480 (30 frames/sec. ): 11 min. 59 sec., 320x240 (15 frames/sec. ): 46 min. 19 sec., 320x240 (30 frames/sec. ): 24 min. 2 sec. *1 The estimated number of pictures that can be recorded or the estimated recording time.